This type is a smaller version of late Dressel 20 type. Martin-Kilcher (1983; 1994) demonstrates the evolution of this type from Dressel 20. Keay (1984) divided it into five variants (Keay 13A-E) and one related type (Keay 13Bis), primarily based on rim variants. Berni (1998) created a new classification that draws a clearer picture of all these types, provided under 'Drawings'. The type generally features a short triangular rim just beneath which are two small oval handles, a bulbous, lemon-shaped body and a short spike. It is occasionally stamped towards the summit of the handle. Originally thought to date from the third to fourth centuries AD (Beltrán, 1970; Manacorda, 1977a; Berni, 1998), excavations at Lyon, Arles and Marseille have yielded examples dating to between the late fifth and early sixth centuries AD (Becker et al., 1989; Bonifay & Piéri 1995). Same area of origin as Dressel 20, with production attested at many kiln sites along the river Guadalquivir and its tributaries between Seville and Córdoba (Beltrán Lloris, 1970; 1978; Manacorda, 1977a). Spain, Portugal, France, Italy, Germany and Algeria (Beltrán Lloris, 1970; Manacorda, 1977a; Beltrán Lloris, 1983; Keay, 1984; Fabião, pers.comm.). 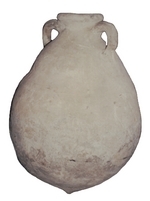 Also found in Scythia at Murighiol and Topraichioi (Opaiţ, 1996: 226). Inscriptions suggest olive-based products (Beltrán Lloris, 1970; Keay, 1984, Rodríguez Almeida, 1984) such as olive oil and possibly olives (CIL XV.4803 and CIL XV.4804).